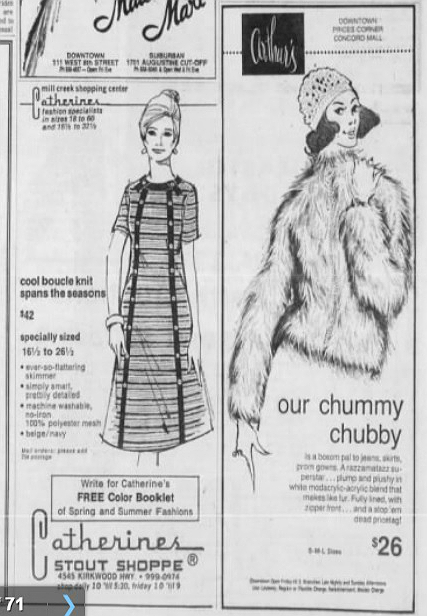 In doing the research for the final post about Margaret Lynch Capone, I came across this advertisement (above, on the right) within the March 23, 1973, edition of The Morning News of Wilmington, Delaware. The advertisement is from Arthur's clothing store, which had locations in downtown Wilmington, Prices Corner and at the Concord Mall. 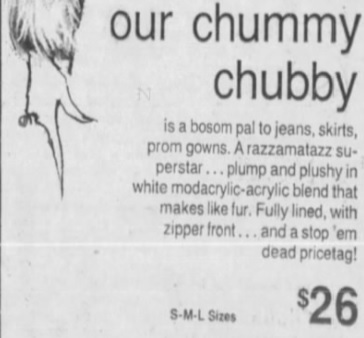 our chummy chubbyis a bosom pal to jeans, skirts, prom gowns. A razzamatazz superstar ... plump and plushy in white modacrylic-acrylic blend that makes like fur. Fully lined, with zipper front ... and a stop 'em dead pricetag! Also, $26 is the equivalent of $146 today, so I'm failing to see the appeal of the "stop 'em dead" pricetag for a big pile of acrylic (even while I'm pleased that no animals were harmed in the making of this outerwear). Also, what's going on with Mrs. Chewbacca's finger in the illustration?